It is a slow day at work, so I started working up some math on a 2nd sub for my theater. My first sub is a SVS 20-39PCi as seen the OLD photo at the bottom of this with my now almost 14 year old daughter who was almost 6 at the time of the photo. 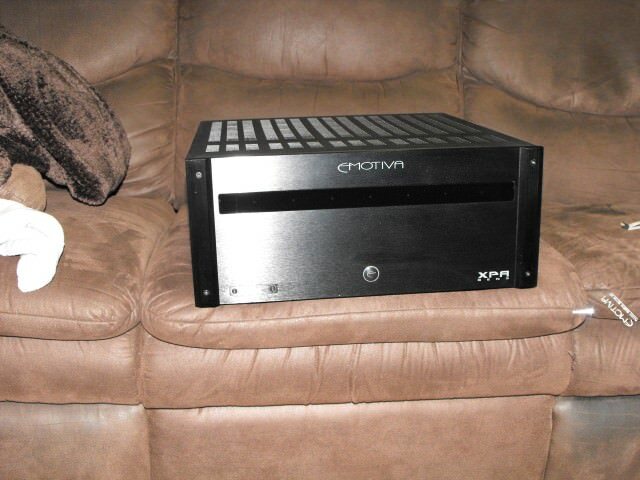 Anyway, after geting some assistance elsewhere on the idea of "replicating" the SVS so that I have 2 closely matched subs in the theater, I was given the following design based off of cubic feet, the driver, amp, etc. Use either a cement form (Sonotube) and make a "sonosub" that looks identical (cost would run about $50 for the tube and endcap material, not including some sort of covering, port grate, etc) or a rectangular sub cabinet out of .75" MDF which would cost me $35 for a sheet of MDF and I could have the home improvement store make some of the big cuts to save time. So I am leaning towards the rectangle sub enclosure because it will be easier to get the material, and also easier to mount the amp since it isn't going onto a curved surface (plus a few other reasons). NOW to the question. With the rectangular sub build, the bottom plate would be either tacked on to the end with a piece that is 16.75" x 16.75" with an interior box opening of 15.25" x 15.25" (I could also put the end cap "inside" the opening using just a 15.25" x 15.25" piece and make the whole thing a little taller to compensate for the volume lost). 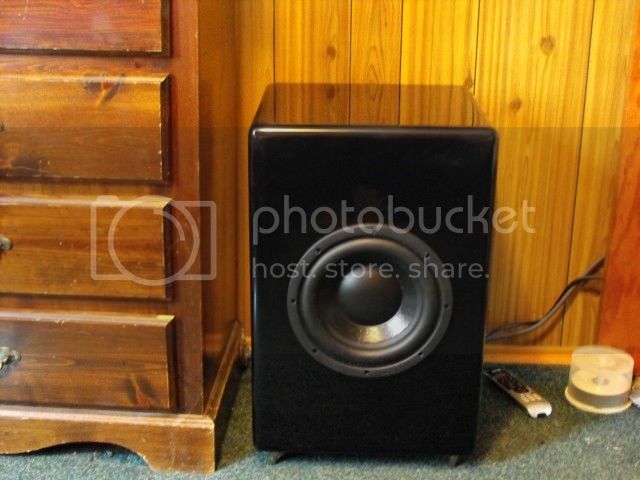 Would an effective opening of 15.25" x 15.25" be enough material for a 12" woofer to mount to? The SVS is 16" in diameter and once taking out the .50" on the thickness of the tube, that comes out to about a 15" diameter circle for a bottom plate. So it SEEMS like it should be OK. The woofer I am using is the popular Dayton Audio RSS315HF-4 and it lists the dimensions as: Overall diameter: 12-3/8", Cutout diameter: 11-1/8", Depth: 5-3/8". I am not in a rush on this, but am just trying to gear up for my winter projects (I still need to get the crown molding and LED rope lights up in the theater, plus the star ceiling before I work on this). Thanks for any help, guideance, or reassurance. I would TOTALLY do the box one. I'm just not convinced that *I* could make the tube one work. Although an external amp would certainly simplify things. You can orient a box in any direction, and set things on it. I think you'll have plenty of material. I might double the driver baffle (i.e. BOTH of the pieces you mention). I want to build a sub someday. I keep coming back to the Rythmik ones. Maybe because I want to try a sealed sub to compare to my SVS PB12-ISD (also OLD, now). I love that picture. Kids grow fast. People try to tell you, but you just can't know until it happens to you. Nah, sounds like too much work. Do what I do. Just grab a beer and watch another movie. The "box" one will still be pretty tall at 30-32" for the "box" and since I am mimicing the sound of the SVS, it will be down-firing so add 3-4 inches to a base for it. I figure it is getting hidden, I need to replicate 4 cubic feet, and it still needs to be skinny enough to fit behind my false wall. It will have a top port on it (just like the SVS) with an almost flush grill (don't want them to touch and vibrate). Good call on just doubling the diver baffle. Makes sense and will really make it solid all around. With a single sheet of MDF (49" x 97") I should have enough even with making some braces internally. Double up the baffle as mentioned, and it should be stout as you would need. I would glue small plywood blocks to mount the t-nuts to just to give them something to bite into. The last time I did t-nuts directly into MDF, they ended up spinning out even after I hot-glued them in. Im sure you probly know all i am about to say, but it bears repeating. MDF is horrible stuff,its made with seriously harmfull chemicals. With that said, use a good quality mask and eye protection when cutting, routing or sanding. Make sure to seal the box well and coat both the inside and outside with paint . The box will stink up the house for weeks on end if this is not done. A trick i picked from the avs forum, if you want the sub flush mounted (and dont have a router) you cut a hole the size of the woofers outter dimension on your front panel. On the back of the panel mount a second panel with a smaller diameter hole cut in it. Oh and the T-nuts can be difficult when you have 8 holes and screws to line up. I drilled all 8 at once which was a mistake.Next time i will do it in groups of 2 , i tend to get in a hurry as the project get near the finish line . I've worked with MDF before and your comments are known to me, but it is good to point it out for someone else that may read this. I remember many years ago when I first used it when I used it to make my control panel for my MAME arcade. I used a forstner bit. With regular wood, it makes a nice clean cut. With MDF it is also a clean hole but the MDF comes out like a giant spiral. Pretty neat, but any cutting or drilling or even looking at the stuff funny makes a huge fine dust mess that carries toxic junk into your eyes and lungs without protection. Even when cutting outside with a light breeze to blow some of it away, it is still nasty. Good point on the sealing of it too. Afaik, the MDF they manufacture today doesn't use formaldahyde like the older stuff of 6-7+ yrs ago but check with your supplier on that. Regardless, you don't want to breathe the dust or get it in your eyes, it's pretty awfull. You'll need a quality hepa style filter on your vac to clean up the dust afterward. Funny thing is I built something similar several years ago with a very similar Dayton driver as you can see here. I still haven't built this thing. I keep thinking about it, and then things like crown molding and color changing LED rope light in my theater sit there, looming overhead (shhh, don't tell anyone, but I should have some fresh updated photos to share soon on that subject). Plus we decided to get back into saltwater fish keeping, so last night I built the support structure for the 120 gallon tank with 40 gallon sump (filter tank as my wife calls it), that all needs ot be finished up over the next couple of days. Then another trip to Los Angeles, then Thanksgiving week which is when I get the tank and "stuff", and then back home for a week, and then 2 more work trips the beginning of December (Baltimore MD / Exton PA one week, Plano TX / Bedford TX the next), then Christmas hits soon after. I am thinking that when I have a few days around Christmas that I might try to hammer this sub out finally.